Technology is the ever-evolving thing that keeps amazing us with its all-new and interesting technological advancements. Every now and then, we come across a product or a concept that was never there before. On such extremely surprising and helpful technological advancement that had ushered into our lives some time back is the energy harvesting technology. Energy harvesting technologies are the ones that take energy from an external source that is usually sun, motion, air and water, which makes it an environmentally friendly concept as well. Many companies and designers are trying to come up with more and more energy harvesting technologies that can make human lives comfortable and help them reduce their carbon footprint. One such designer is Marjan van Aubel who saw a dream to make a highly efficient energy harvesting technology and soon realized it. Her two products, the “Current Window” and the “Current Table” are the two precious gifts she has given to the energy harvesting industry. This gorgeous window with colored solar cells is Marjan van Aubel’s work, a Dutch designer. 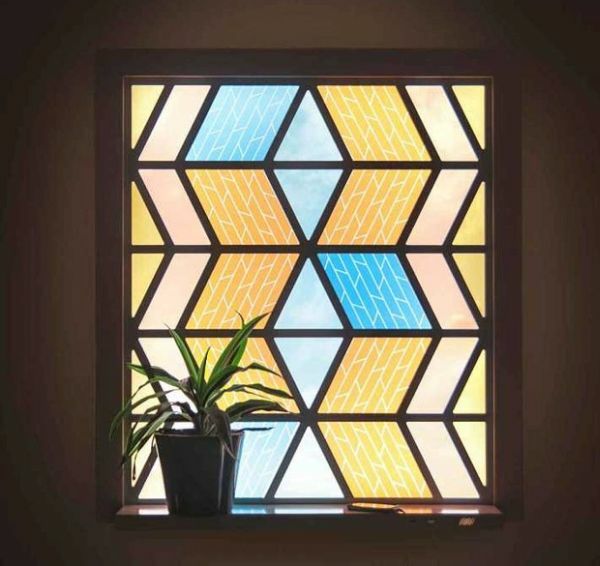 The window harvests energy from the sun and further converts it into electricity. The solar cells are organically dyed, which first collect sun’s energy and then transform it into electricity. She has brought into use the lovely colored glass that has a tremendous visual appeal, and when it works like solar cells, automatically it rises on the scale of functionality as well. Different colored panes made with dye-sensitized solar cells generate power by using property of color. This same property if you remember is used for photosynthesis in plants. This eco-friendly electricity alternative powers digital gadgets via an integrated USB. The orange, blue, and pink colored solar cells convert sun energy into electricity and then store it. Tiny particles of titanium dioxide in the light absorbing dye convert energy into electrical current. The vein type lines that you see on the windowpanes resemble the veins of a plant and refer to the electrical current flow. Depending upon the availability of light, each window can produce 25 watts of electricity every day. During overcast days, the window still manages to supply power owing to its backup battery hidden in the windowsill. A table equipped with solar panels on its writing surface is a yet another product powered by energy harvesting technology. The current table collects daylight and converts it into electricity to use it to power appliances. 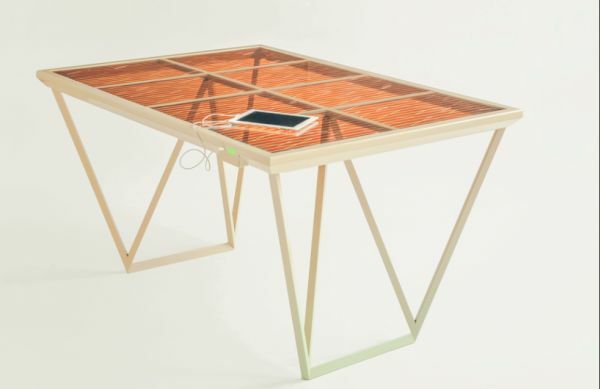 The table with triangular trestle legs has a tabletop made of clear orange glass, and has two charging points that you can use to charge devices. The Current Table uses the same technology like the Current Window to produce electricity. The organically dyed solar cells inside the glass panels use the property of color to produce electricity. Dying makes titanium oxide particles to receive more and more sunlight, absorb it, and produce increased amount of electricity. The Current Table does not always require direct sunlight to charge, which is a contrasting feature if you compare it with the traditional solar powered products. It charges itself using diffused sunlight inside homes, and the light display on the charging point enables you to know how much battery is left in it. You read or do your work using computer on it and side by side, the table will keep charging your system. The Current Table seems to be a perfect addition to libraries and restaurants wherein people can sit for long, study or chat while getting their devices charged. Energy harvesting devices designed by Marjan van Aubel are super functional and beautiful in design.